As you all know from your own personal experiences, life is a crooked road that leads one through some pretty amazing times as well as some very rough times. Our task is to endure, keep smiling and enjoy all the good things that abound around us. Over the last 10 months, life has thrown me a sizable obstacle that has set me on a new life course. As in all life-changing events, there has been much pain and regrouping as I struggled to redirect my energies. But that is not what I want to write about, but it is related. Let me continue. As a teacher of 30 plus years and a life-long student of human behavior I have witnessed much suffering of friends, students and acquaintances and have counseled my students and friends, who by their own admission, were in deep depression. Since I have never before had to deal with feelings of this magnitude, I have always felt as if I were looking into depression as an outsider to this experience. I felt as though I had an idea of what they must be feeling but never truly felt the full fury of their darkness. Recently, I believe I peered into the dark hole of depression, if only for a short time. A series of unrelated events unfolded around me, and for a few long days, I burrowed deeper into this strange world that I have never ventured into. Because of this, I felt the need to share some ideas with others so that they might better understand what people around them who are dealing with this problem are feeling. Make no mistake, my time in this realm was brief, but it helped me begin to realize what other people who live their lives in a constant state of depression must endure. I am going to attempt to pass on to you some of the feelings I encountered during this brief time. First and most encompassing was the sincere belief that no one could understand what I was feeling. I was marooned on an island with no escape that I could envision. The notion that I was alone was a heavy blanket pushing me to the ground! At times I felt as if I was in a large, deep, dark hole looking up at the sky with no perceivable way of climbing out. In my mind were ideas-some bizarre, some strange and some frightful- like automobiles moving by me at a high rate of speed on an interstate. They came quickly and left traces of pain and remorse in their wake. As I circled deeper into this funk, I imagined I was somehow drowning in my own weird way. I could go on and on about the crazy ideas that coursed through my mind but I think I have made my point. What I endured for a short time was trivial in comparison to the person who spends his/her life in this river of remorse. As I gradually reemerged from this terrible state, I could only think of what it must be like to live in this place full time! In our world, there are many people who suffer from this kind of intense depression. As a society we tend to push them by the wayside, ignore them, and hope that they take their negative feelings somewhere else. It is no wonder that we have such a high suicide rate in this country! We live in a country that focuses on material things and power and so spend billions of dollars on marginally successful attempts at helping people who are suffering from depression. The basic idea of loving one’s neighbor has all but disappeared for many and been replaced with medicine and counseling. That is what this article is about! I feel that I am one of the lucky ones in that many of my friends and family have stepped up to help me through some of this emotional maze, but I wonder how many people are struggling with depression and do not have the support I had. 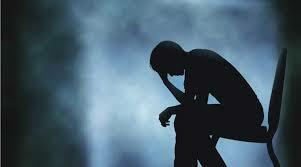 When encountering a person who is depressed, it is important to realize a few quick key points. You are not going to fix them! You are not going to say some cute words that are going to magically bring them from this area of darkness. All you can do is be a friend, let them know you are there if they need you. This too can be a problem because depressed people do not tend to call out for help in the traditional sense, so you must generally make the first move. Of course, getting someone else involved who is trained in this area will probably be very helpful as well. All said and done, this is an unlit corridor at best. There are no clear answers or sure-fire cures- only time, patience and love. If you know someone who is dealing with life-long depression, make the difficult decision to be there for them. You might make a significant difference or at least comfort them in their world of suffering.